Boasting a lush landscape, crystal waters and the breathtaking Napali Coast, among other picturesque sites, the “GARDEN ISLAND” is truly a treasure. Penned as “A LITTLE SLICE OF HEAVEN” by Conde Nast Traveler, it’s no mystery why the fairytale-worthy island of Kaua‘i presented an ideal filming location for numerous films—like THE DESCENDANTS and JURASSIC PARK— to mention just a few blockbusters on Kaua‘i’s resume reel. Ranked the NO. 8 TOP ISLAND OVERALL in Travel + Leisure’s WORLD’S BEST AWARDS (2015 edition), Kaua‘i is hailed for its pristine ambiance. The island’s hotels landed two spots in Conde Nast Traveler’s 2016’s Top 10 Resorts in Hawai‘i— not too shabby for the oldest of the main Hawaiian Islands. Kaua‘i’s golden beaches, thrilling ocean sports, shopping locales and charming towns are rich in history and ALOHA SPIRIT. Don’t let this island’s small size fool you; Kaua‘i happens to be home to some of Hawai‘i’s most spectacular attractions. At 101 THINGS TO DO, we strive to ensure that you don’t miss experiencing ESSENTIAL KAUA‘I attractions. Simply follow our handy guide to discover the best of all there is to do and see on the Garden Isle. It won’t take long to understand why travelers voyage to the WETTEST PLACE ON EARTH year after year. To begin, PICK A BEACH, and PUT ON YOUR SNORKEL GEAR! Whether you GOLF THE GARDEN ISLE on Kaua‘i’s famous fairways, GET CARRIED AWAY IN A HELICOPTER, GO ON A FOODIE TOUR, or PAMPER YOURSELF at an outdoor spa surrounded by mountains and sea, it’s all here. RIDE THE SWELLS IN AN OCEAN RAFT during the day, then journey down THE PATH OF THE ANCIENTS for an afternoon kayak down the river with misty jungle plants as your backdrop. En route to your next destination, pull over to SEE OPAEKA‘A FALLS, the island’s most accessible waterfall. Perhaps you’ll FEAST AT A LU‘AU, INDULGE YOUR SWEET TOOTH with a local treat or MUSE & GROOVE. End the evening over a fruity mai tai with the locals as you DRINK AFTER DUSK. Whether you seek activity or serenity, Kaua‘i’s 113-mile shoreline has something for you. Just don’t forget to lineup your line of sight to CAPTURE THE PERFECT SHOT and take home a few KAUA‘I-MADE GOODS amidst the excitement. Whatever draws you to the island, enjoy! But don’t fret if you can’t squeeze in everything that Kaua‘i has to offer. We’ll be awaiting your return to one of the most sought-after vacation spots in the world with 101 THINGS TO DO. 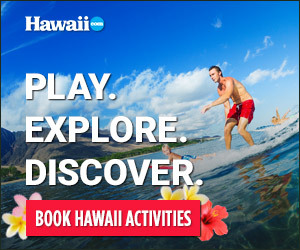 View our top picks below or see all 101 Things To Do on Kaua‘i!